View image details of Roger Bilodeau, Q.C. Roger Bilodeau is a native of Ste-Agathe, Manitoba (Canada). He studied common law in French and received his law degree (LL.B.) from the Université de Moncton in 1981. In 1987, he completed graduate studies in law (LL.M.) at Duke University in the United States. He has been admitted to the Law Society of Manitoba, the Law Society of New Brunswick and the Law Society of Upper Canada. He is also a member of the Canadian Bar Association. He has practiced law in Manitoba, New Brunswick and Ontario. He was also a professor of law at the Faculté de droit de l'Université de Moncton. From 1999 to 2003, he had the privilege of serving as Deputy Attorney General and Deputy Minister of Justice for New Brunswick. He also worked with a Canadian consortium on a capacity-building project aimed at strengthening democratic governance in Iraq, focusing on the management of language diversity and the protection and the promotion of human rights, as well as women's political participation. 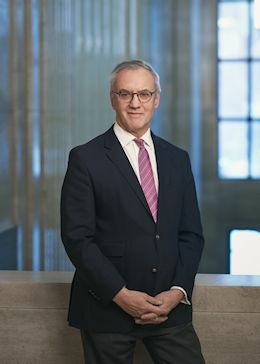 During the course of his career, he has presented cases in both official languages in all Manitoba and New Brunswick courts, in the Supreme Court and the Provincial Court of Nova Scotia, as well as in the Federal Court of Canada. He also acted as one of the senior counsel to the Commission of Inquiry into Air India Flight 182.
participates in selected outreach activities on behalf of the SCC, including SCC delegations in regard to the activities and meetings of various international associations of supreme courts from numerous countries. In his capacity as Registrar, he is also a member of the Heads of Court Administration (HoCA), a national committee which brings together the lead government officials responsible for court services in all Canadian jurisdictions.